Dual flash mount allows flash units to be positioned at any angle around the subject for a wide variety of lighting effects. 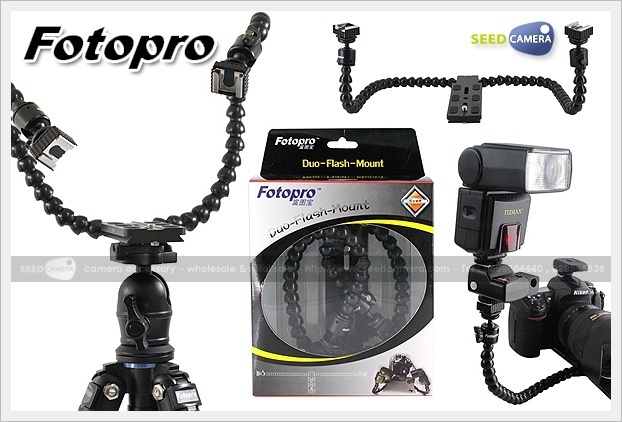 • Ball joints supporting the flash units allow for even greater control of the flash position and angle .In addition,there is one 1/4-20 treaded mount point on either side of the ball to attach other accessories. • 2 fully articulating arms made from high-quality ultra lightweight flex-conduit. These arms allow flash units to be positioned at almost any angle around the subject for a wide variety of lighting effects. • Extended Flexible Arm Lenght : 65 cm ( 30 cm for each side). • Folded size : 14.0 x 13.0 x 5.0 cm. • Max loading capability : 350 gram for each arm.